Acorn Pies: Make a Recycled Ship! I got inspired by the treasure ships I saw on Se7en, and started collecting tetra pak juice boxes with the help of some friends! When we had enough I cut off one side of each, and pulled out a flap to make a prow. 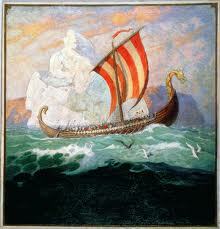 I showed the children some wonderful N.C. Wyeth illustrations of ships, including this viking ship. We talked about things you see on ships.....sails, oars, cannons, windows and portholes, flags, and figureheads. I showed them some pictures of figureheads, too. On Se7en, the children paint their ships and glue some goodies onto them. I decided the children should use collage papers so they could take their ships home right away, instead of waiting until they were dry. 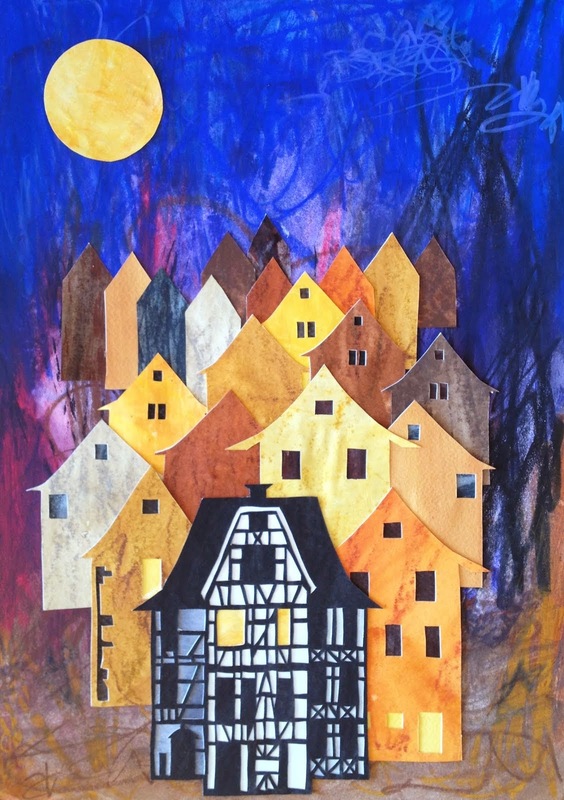 They plunged into the wealth of collage papers I had made and glued the colorful papers onto their ships, or glued on paper they had colored, because we didn't have much brown left, like the ship above. I love this Swiss flag! I advised them to cut their figurehead out of construction paper, though, since it is colored on both sides, and showed them how to slit the end, split the slits to both sides, and glue the figurehead to the ship. It is hard to take clear, bright pictures in our space, which has very low light. I'm hoping the school will install some brighter bulbs soon. I adore this combination of orange and blue. This ship has a mermaid figurehead. What a scary skull and crossbones on this beautiful color combination! This artist made his box into a dragon with wings. Some of the children really, really wanted their boats to float, which explains the popsicle sticks underneath. They are pontoons. I told them that their boats would tip over because they are top heavy, and that the glue would melt. But I wouldn't be surprised if some ships went into the sink anyway once the children got home. Children love to make things they can play with! and the unicorn on the sail and figurehead on this ship. 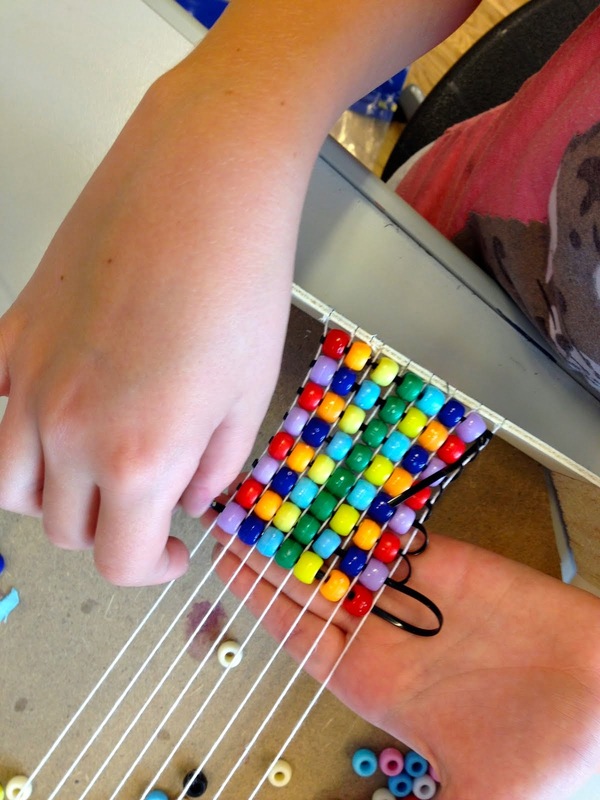 By the way, the children who did this project ranged in age from 5 to 11 or so. These ships are awesome! I love the mermaid. All of the ships are so creative...and yes I can imagine my boys would have probably tried them out in the bathroom sink. hahaha! These are wonderful. I will have to file this project away for National talk Like a Pirate Day. Take care.